In April we did our first live show during the KPOV membership drive. Instead of archiving the live show, we edited this version to remove the now irrelevant live bits. Enjoy! Rae Sikora came to Bend last fall and gave a talk on animal intelligence called Brilliant Chickens and Einstein Squids. In the excerpt we played, Rae tells a great chicken story. Rae co-founded the Institute for Humane Education and is the co-founder and co-director of Plant Peace Daily. Keeping to our chicken theme, host Judy retells a touching story from the book Ninety-Five. 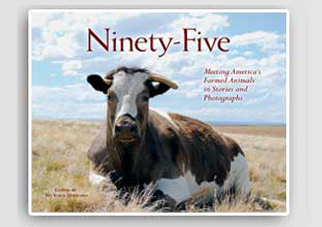 Meeting America’s Farmed Animals in Stories and Photographs, published by No Voice Unheard. We talked with Colman McCarthy, who has been a journalist for the Washington Post for over 30 years, and founded The Center for Teaching Peace in Washington D.C. He teaches courses at high schools and colleges that emphasize alternatives to all types of violence, including violence against animals. Colman is a regular speaker at high schools, universities, and peace conferences around the country. He is author and editor of numerous books and articles, including Solutions to Violence, I’d Rather Teach Peace, and his latest book, At Rest With The Animals. 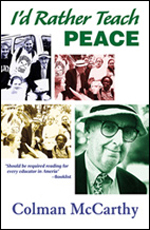 You can access Colman’s entire eight-session / 48 essay Class of Nonviolence online! On April 23, from 12 p.m. to 2 p.m., VegNet Bend will be celebrating Earth Day. The Earth Day fair will be located downtown at The Environmental Center, and VegNet’s table will be located in the demonstration garden. VegNet Bend monthly potluck, 6p, April 27, The Environmental Center, 16 NW Kansas, Bend. Bring a vegan dish, your recipe, and a place setting. For more information on either event, see VegNet Bend on Facebook or vegnetbend.org. We mourn the recent passing of Shirley Wilkes-Johnson, passionate vegan and animal rights activist and one of the producers and hosts of Vegan World Radio on Pacifica’s KPFT 90.1 FM in Houston, Texas. Although we did not know Shirley personally, host Barb is a long-time listener of Vegan World Radio and will miss her voice and contribution to the vegan community.